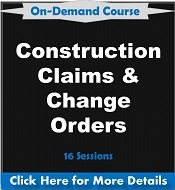 The Essential Course on Successful Management of Construction Claims and Change Orders includes 16 90-minute sessions presented by 30 of the construction industry's leading attorneys, consultants and practitioners and covers everything from identification, anticipation and prep work for prevention to pricing and negotiation of construction claims. The course goes into detail on CPM schedules, loss of productivity, differing site conditions, delays and much more to give you and your team the most comprehensive overview of construction claims' processes. Plus, included with this information-packed online training program is a FREE hard-cover copy of Construction Contract Claims, Changes & Dispute Resolution - 3rd Edition published by ASCE Press. Each chapter is authored by one or more construction experts and/or attorneys; these very same authors present their respective chapters of the training series. We are finding the trainings very useful, so thank you for all of the effort that it takes to make them happen. Very good — excellent knowledgeable speakers that spoke very well. Good content. By its nature it covers a lot of information. Each session is an individual 90-minute recording that can be accessed at your convenience. It includes the complete Q&A session, so you won't miss any valuable information and will be able to gain a better understanding of what's happening in the industry. It also comes complete with its own set of the PowerPoint slides, so it's easier to follow the instructors and have groups of people watching together. Click here to download the complete brochure for more detail. Both owners and contractors are still getting into knots in their approach to managing and controlling claims. Conflicting interests, schedule and budget constraints, the urgency of dealing with day-to-day issues and the varying levels of experience of the project staff leave open many opportunities for adversarial relationships of the contracting parties. This recorded webinar series is a must if you're a contractor, public or private owner, subcontractor, construction manager, owner's representative, architect or other design professional managing projects or providing contract oversight services. Order this exclusive training tool today, so your staff can glean valuable insights from the experts presenting this comprehensive series to avoid costly mistakes, raise expertise and help them learn new ways to avoid and manage claims. The claims reference book and newsletter will serve as valuable references when new issues arise and to bring new court outcomes that may affect your project. PDUs/PDHs - Education Credits: Certificates of completion are available for use in obtaining education credits. This presentation was very well structured, the hypothetical example helped get into perspective the context of the message. Webinar speakers organized very well their time and exposition content, sending a clear message. * Your laptop or tablet doesn't have a DVD player? No worries - the program is available on a USB drive upon request.